Penelitian - Imaging tools like X-rays and MRI have revolutionized medicine by giving doctors a close up view of the brain and other vital organs in living, breathing people. Columbia University researchers report a new way to zoom in at the tiniest scales to track changes within individual cells. "We can use this technology to visualize metabolic activities in a wide range of animals. By tracking where and when new proteins, lipids and DNA molecules are made, we can learn more about how animals develop and age, and what goes wrong in the case of injury and disease," said Wei Min of the Columbia University. The breakthrough involves the use of heavy water as a chemical tracer. Made by swapping water's hydrogen atoms with their heavier relative, deuterium, heavy water looks and tastes like regular water and in small doses (no more than five tablespoons for humans) is safe to drink. Once metabolized by cells in the body, heavy water is incorporated into newly made proteins, lipids and DNA, where the deuterium forms chemical bonds with carbon. When these carbon-deuterium bonds are hit with light, they vibrate at varying frequencies, the researchers discovered, allowing each macromolecule to be identified as a protein, lipid or DNA. From these frequency signatures, they could track the growth of new proteins, lipids and DNA in the animal's brain, skin, gut and other organs. Though heavy water is already used to label proteins and lipids to track metabolic changes, analysis is currently done on a mass spectrometer, on cells extracted from the body. This method now makes it possible to visualize subcellular changes in real time and space. "We get a continuous picture of what's happening inside living animal cells. Previously, we had only a snapshot," said Lingyan Shi of the Columbia University. In one experiment, they watched a bright line emerge around fast-growing brain and colon tumors in the mice. As the cancerous cells divided, more deuterium was incorporated into their newly made proteins and lipids. The experiments also offered new insights into cell development and aging. "This method creates a sharp line between healthy and cancerous tissue, making it much easier to remove the tumor," said Shi. In the roundworm, they watched fat production rise and fall in the worm's reproductive system as it aged. Fat helps the worm's eggs to mature, and once this added fat was no longer useful, fat formation slowed, they found. 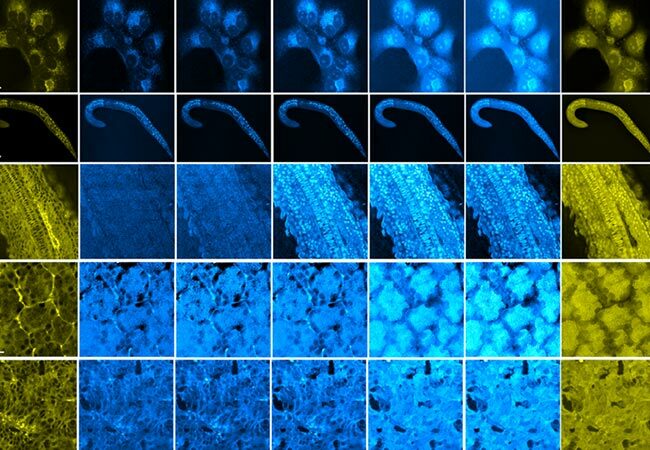 They also saw clumps of new protein form in the older worm's body, suggesting that deuterium-labeled SRS imaging could be used to track protein deposits, and thus aging-related disease. In the developing brains of baby mice, they observed the formation of a layer of insulating fat, called the myelin sheath, around each cell. Watching the process in real time suggested to the researchers that deuterium-labeled SRS imaging could be used to tell if a child's brain is developing properly, or if patients suffering from multiple sclerosis, a disease that attacks the brain's myelin and disrupts information flow, might be recovering.